Peeling eyelids can be incredibly annoying and can cause a lot of discomfort when left untreated. 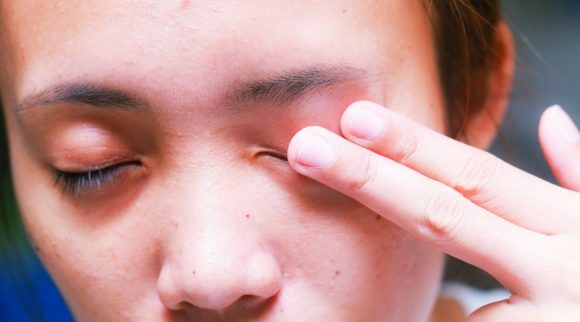 Peeling eyelids, typically the result of dryness in the area around the eyelids, can lead to irritation, redness, and itchiness around the affected area, making it difficult to function as effectively as normal. Fortunately, peeling eyelids can be properly dealt with and treated at home without any assistance from a doctor. 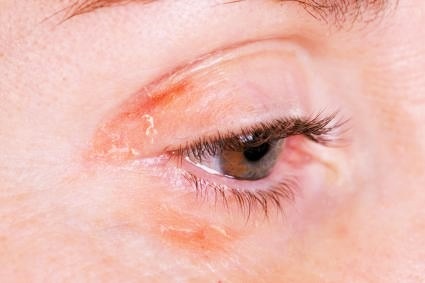 There are numerous at-home care techniques that help reduce the effects of peeling eyelids and treat the underlying cause, which ultimately allows the peeling eyelids to go away. Two of the most effective at-home treatment options for peeling eyelids include moisturizer creams and eye pads. Moisturizer can help lubricate and eliminate dryness in the area where the eyelids are peeling, which soothes and drastically reduces the symptoms quickly while also treating the underlying cause. 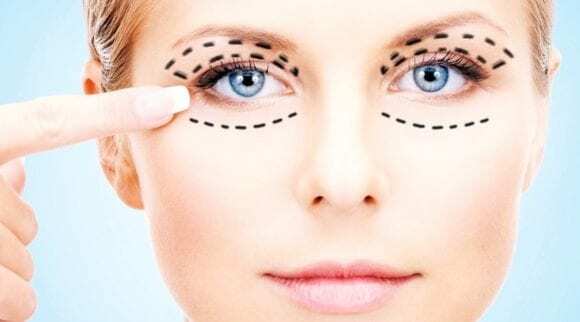 Eye pads and eye masks also work wonders at not only treating peeling eyelids after they occur, but also preventing episodes of peeling eyelids from happening in the future. 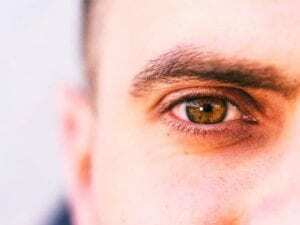 By understanding exactly how to recognize the causes of peeling eyelids and treating the symptoms as well as the underlying cause, you give yourself a great chance at overcoming peeling eyelids altogether. This review guide details exactly what causes peeling eyelids, how peeling eyelids can effectively be treated, and specific treatment products to help you overcome your peeling eyelids, ensuring your eyelids stay feeling healthy and lubricated all day long. Peeling eyelids can be the result of a number of different factors and conditions. 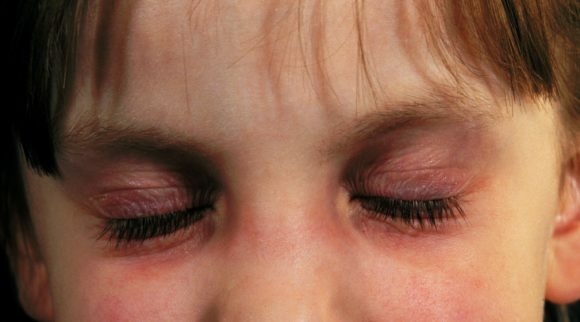 In most instances, peeling eyelids are caused by dry eyelids. When eyelids become dry, it can lead to a number of issues, including the eyelids beginning to peel. However, simply understanding that peeling eyelids are often caused by dryness is not enough. Instead, it is important to determine the exact cause of the dry eyelids that lead to the eyelids beginning to peel. Perhaps the most common cause of peeling eyelids is a variety of environmental factors. The eyelids can become dry for a number of different reasons, such as working in a dry environment, exposure to low humidity levels, and being around hot water. All three of the aforementioned situations can lead to an increased risk of suffering from peeling eyelids. 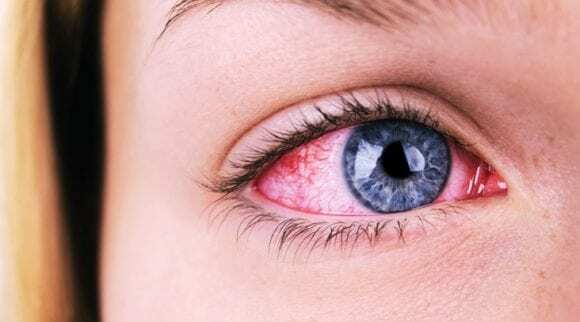 In order to minimize the risk of peeling eyelids, be sure to use a humidifier, take frequent breaks, and consider using the moisturizer, eye drops, and eye pads seen below. 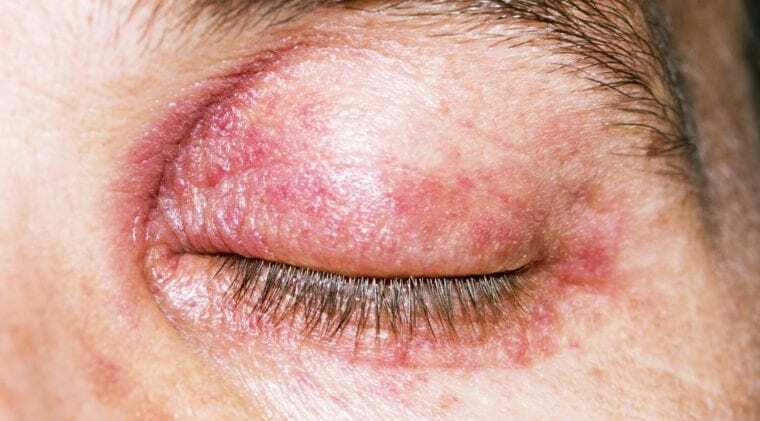 Dermatitis and blepharitis, common skin conditions that may lead to peeling eyelids, also should be considered when diagnosing the cause of peeling eyelids. There are two different types of dermatitis, contact and atopic dermatitis, and they both may need additional treatment beyond at-home care. Blepharitis is somewhat similar to dermatitis, although blepharitis is caused by bacteria that results in problems with the eyelashes. 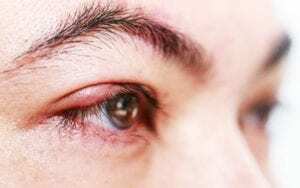 How Can I Treat Peeling Eyelids? Of course, there are also lifestyle changes that can significantly help with peeling eyelids as well. Many cases of peeling eyelids arise out of exposure to dry environments, such as working in a room with dry air. A simple solution to this problem is to use a humidifier to keep the room from becoming too dry. It is also encouraged to take frequent breaks when in front of a computer screen, driving, or working outdoors in any capacity to ensure the eyes do not become fatigued and lead to peeling eyelids. Along with lifestyle changes, using moisturizer, eye pads, and various other products, you can keep your eyelids from becoming too dry. This subsequently ensures peeling eyelids do not continue to occur in the future while also treating any current symptoms that may exist. While at-home products and minor lifestyle changes can help, be sure to visit the doctor anytime peeling eyelids continues for an extended amount of time, worsens, or is a symptom of a much more severe issue. Moisturizer and eye cleanser are perhaps the best ways to treat peeling eyelids in the short term as well as on a long term basis. Moisturizer works to add lubrication to the eyelids, preventing them from becoming dry and peeling. Eye cleanser works in a similar manner, although it also works to wash out the harmful particles and bacteria that may be contributing to the peeling eyelids. However, not all moisturizers and eye cleansers are created equal, and there are certain options that are simply better than others. When choosing, it is helpful to know the most important factors to consider. For your benefit, we have reviewed each peeling eyelids product on the four most considerable factors: affordability, effectiveness, ease of use, and an overall combination of all factors. Without further ado, let’s get into the best moisturizer and eyelid cleanser products for peeling eyelids. The Heyedrate Lid and Lash Cleanser is a wonderful solution for peeling eyelids and dry eyelids in general. This cleanser helps to remove contaminants from skin, and it’s a great option for those who want to feel relief from itchy, dry, peeling eyelids. This product is super affordable and will only run you a few bucks per month. 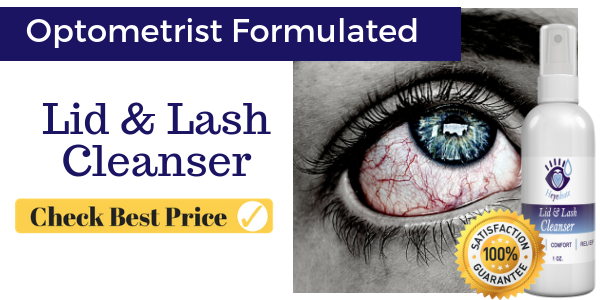 Peeling eyelids can cause an awful feeling that’s distracting for your life, and this eyelid cleansing spray works to treat the symptoms and underlying cause at a very affordable price. Heyedrate Lid and Lash Cleanser is super effective, working to eliminate contaminants on the skin. It contains only three ingredients: hypochlorous acid, electrolyzed water, and sodium chloride, so you know it will be super gentle on your delicate eyelids as well. All natural, organic, vegan, free of alcohol, parabens, fragrances, preservatives, and sulfates, this lid and lash cleanser is simple to use. Spray it directly onto closed eyelids, rub it in, and let it dry. Do this morning and evening. It’s really that simple! One of the main causes of peeling eyelids is a failure to wash off harmful residue that can come into contact with our eyelids throughout the day. 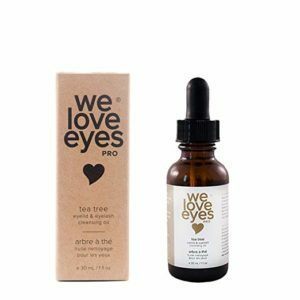 The All Natural Tea Tree Eyelid Cleansing Oil by We Love Eyes works by cleansing the eyelids and washing away harmful residue that could otherwise cause peeling eyelids. The All Natural Tea Tree Eyelid Cleansing Oil is a very inexpensive peeling eyelids product that is certainly worth the investment. Peeling eyelids can cause an undesirable feeling that can distract you from working, and this eyelid cleansing oil works to treat the symptoms and underlying cause at a very affordable price. Although the application of this eyelid cleansing oil is simple, it is still one of the more effective methods of washing away harmful particles and bacteria on and around the eyelids. 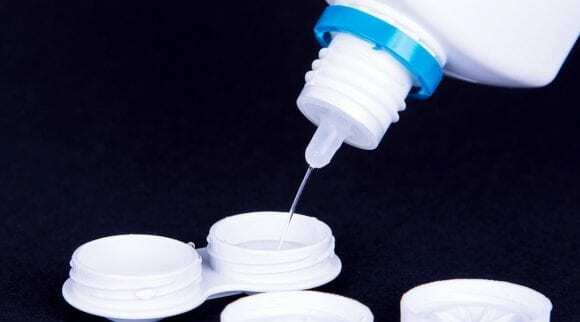 This helps prevent blepharitis and other common eyelid conditions that can lead to peeling eyelids. The application of this eyelid cleansing oil by We Love Eyes is very easy. 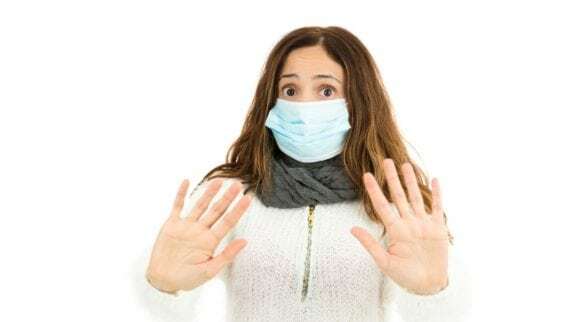 After washing your hands and removing your contacts, simply place two to five drops on a cotton swab or soft towel, and then gently wipe the eyelids, removing any substances that may have gathered. The All Natural Tea Tree Eyelid Cleansing Oil is perfect for anyone who wears eyeliner and makeup that may accumulate on the surface of the eyelids. Keeping the eyelids clean is an important step to preventing peeling eyelids, and this eyelid cleansing oil helps individuals do just that. The Dr. Fischer Premium Eyelid Wipes essentially achieve the same thing as eyelid cleansing oil, although many view them as much easier to use than cleansing oil. When considering the effectiveness, ease of use, and affordability, it is easy to see why so many are drawn to these eyelid wipes by Dr. Fischer. This set of 30 premium eyelid wipes is available at an extremely affordable price. While one may be able to get more uses out of eyelid cleansing oil, almost everyone in need can still afford these Dr. Fischer Premium Eyelid Wipes, and they are certainly worth the investment. The Dr. Fischer Premium Eyelid Wipes are extremely effective at treating peeling eyelids and the underlying cause of peeling eyelids. Eyelid wipes work well when removing makeup, sweat, and crusted matter from the eyelids, which in turn reduces the chance of developing peeling eyelids. There may not be an easier peeling eyelids product to use than the Dr. Fischer Premium Eyelid Wipes. Simply remove the towelette from the container, gently wipe the debris off of the eyelids and surrounding areas, and enjoy eyelids that are lubricated, clean, and do not peel. These eyelid wipes by Dr. Fischer are one of the best ways to treat and prevent peeling eyelids on the market. 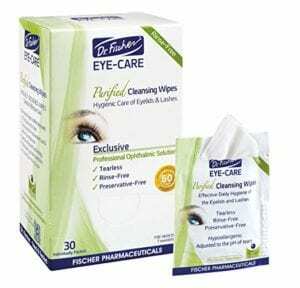 The Dr. Fischer Premium Eyelid Wipes are safe, effective, and easy to use. 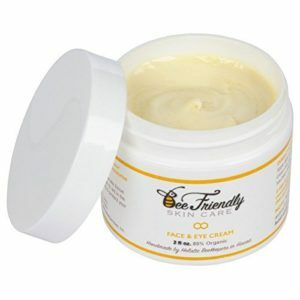 BeeFriendly Face and Eye Cream is one of the most effective peeling eyelids treatments on the market today. This eye cream leaves the skin on and surrounding the eyelids feeling hydrated and moisturized throughout each and every day. Considering the effectiveness, ease of use, and the amount provided in each container, it is amazing that BeeFriendly can offer this face and eye cream at such an affordable rate. This two-ounce bottle of eye cream simply blows the rest of the eye cream competition out of the water. For those who are looking for the safest and most natural skin moisturizer to treat their peeling eyelids, look no further than the BeeFriendly Face and Eye Cream, which is comprised of all-natural ingredients and leaves no adverse skin reactions. The result is perfectly healthy, hydrated skin every time. Although it may take more work and preparation than an eyelid wipe, eye cream is still fairly easy to apply. The first step is to wash or rinse the eyelids out, and then gently apply the eye cream in circular motions. Eye cream can even be used along with eyelid wipes. BeeFriendly Face and Eye Cream is perhaps the most natural eye cream on the market today, utilizing only natural products to ensure quality results and fully hydrated skin. Anyone who suffers from peeling eyelids is sure to love this product. 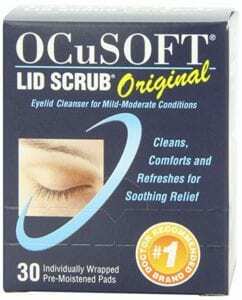 OCuSOFT Lid Scrub is one of the most trusted peeling eyelids products on the market today, and it is affordable, effective, and extremely easy to use. The key to overcoming peeling eyelids is to keep the eyes clean and lubricated, and OCuSOFT Lid Scrub helps you do just that. OCuSOFT Lid Scrub Original is one of the most affordable products on this review guide and on the market in general. When compared against other eyelid scrubs in a similar price range, there is no doubt that OCuSOFT Lid Scrub is one of the best, especially when considering each pack comes with 30 pads. These eyelid scrubs by OCuSOFT are extremely effective at preventing dry eyes by removing makeup and other debris. By removing the debris and keeping the eyes lubricated at the same time, OCuSOFT Lid Scrub ultimately helps treat and prevent peeling eyelids. OCuSOFT Lid Scrub Original is extremely easy to use. After washing your eyelids and removing your contacts, simply wrap the pad around your finger and gently wipe the debris from on and around your eyelids. If you are looking for an inexpensive peeling eyelids product that allows you to remove harmful particles on and around the eyelids and keep your eyes moistened at the same time, then the OCuSOFT Lid Scrub Original is the product for you. Brickell Men’s Restoring Eye Cream is much more than a peeling eyelids treatment product. This eye cream tailored specifically for men helps reduce puffiness, wrinkles, and dark circles, along with the ability to treat peeling eyelids. Brickell is a top name in the eye care industry, and as such their prices reflect their quality. While the Brickell Men’s Restoring Eye Cream costs more than the average peeling eyelids cream, the quality is worth the minor increase in cost. 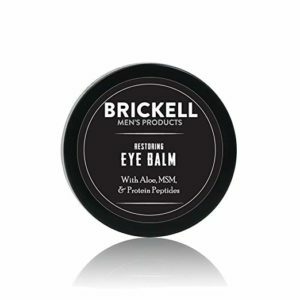 Brickell Men’s Restoring Eye Cream is great for anyone who suffers from peeling eyelids caused by dry eyes. This eye cream helps those who suffer from dry eyes lubricate and keep their eyes hydrated throughout each day, treating peeling eyelids effectively. The instructions for Brickell Men’s Restoring Eye Cream is a total of 17 words. In other words, it is extremely easy to use. Simply rinse your eyelids and apply a small amount of the eye cream once in the morning and once at night to treat and prevent peeling eyelids. Brickell Men’s Restoring Eye Cream is a natural and organic peeling eyelids treatment product that is both effective and easy to use. Those who suffer from aging patterns around their eyes in addition to peeling eyelids are sure to love the numerous benefits of this product. The Yon-Ka Contours for Puffy Eyes is perhaps the highest quality peeling eyelids treatment product on the market today. This contour is an eye cream that not only treats peeling eyelids, but it also helps reduce the puffiness of the area surrounding the eyes and removes dark circles. With quality often comes a more expensive price. The Yon-Ka Contours is without a doubt one of the most effective and trusted eye creams on the market for peeling eyelids. However, it is priced accordingly, and it is one of the more expensive eye creams on this review guide. If you do not mind paying for quality, the Yon-Ka Contours for Puffy Eyes is hands down one of the best eye creams on the market, treating peeling eyelids long term and reducing the current symptoms quickly. The Yon-Ka Contours for Puffy Eyes is very easy to use, and when and how you choose to use it is completely up to you. The recommended way to use it is to apply the contour each morning for 15 minutes, and then wash the contour away with cool water. If you are simply looking for the most effective way to keep eyelids hydrated and prevent peeling eyelids and do not mind paying for quality, then the Yon-Ka Contours for Puffy Eyes may be the best choice. The Wilma Schumann Hydrating Collagen Eye Pads are a unique approach to peeling eyelids treatment. Although they work as effectively and in a similar manner, the structure and way they are applied are slightly different than the average approach. The Wilma Schumann Hydrating Collagen Eye Pads come in a package of five, and they are affordable; although you are likely required to buy multiple packages when planning to use long term. However, the quality is certainly worth the investment. The Wilma Schumann Hydrating Collagen Eye Pads are very effective at treating peeling eyelid symptoms as well as the underlying cause of the peeling eyelids. Made safe and naturally, these eye pads work wonders for removing debris and keeping the eyelids clean and lubricated. Whereas most eye pads are simply used to wipe away the makeup and other debris that exists along the eyelids, the Wilma Schumann Hydrating Collagen Eye Pads are meant to be left on for several minutes, ensuring quality results while remaining very easy to use. If you are looking for a very effective, affordable peeling eyelids treatment strategy, then utilizing the Wilma Schumann Hydrating Collagen Eye Pads are the way to go. They are easy to apply and certain to provide positive results when dealing with peeling eyelids. Eye pads and eye masks are also very successful at treating and preventing further occasions of peeling eyelids. Each eye pad or eye mask is different, although they both essentially work by providing a soothing relief to the symptoms of peeling eyelids. These symptoms commonly include irritation, redness, and a burning sensation. Eye pads and eye masks often utilize a compress system of either hot or cold temperatures to relieve peeling eyelids discomfort. Much like moisturizer and eye cleanser, the quality of eye pads and eye masks can be determined by examining the affordability, effectiveness, ease of use, and an overall combination of every factor. The following are some of the best eye pads and eye masks for peeling eyelids on the market today. It is no secret that uncomfortable, fatigued eyes can lead to peeling eyelids. The more rested and relaxed our eyes are, the healthier they are. This Heyedrate Eye Mask helps by providing heat therapy to the eyes, treating dry eyes and peeling eyelids. Considering the advanced amount of design that went into making this eye mask, it is amazing that it is available at such a low price. It is reusable and has good durability, so you are certain to get your money’s worth when choosing this eye mask as your form of peeling eyelids treatment. There is nothing more soothing for peeling eyelids than a warm compress to relieve the symptoms. Peeling eyelids can feel awful, but the symptoms can be drastically reduced and even prevented with this eye mask. 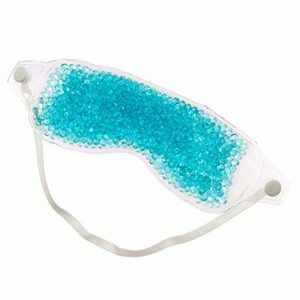 There may not be a more cleverly designed eye mask for peeling eyelids on the market than this one, which has various features to ensure a relaxing experience. Simply microwave the mask for 20 seconds, place the strap around your forehead, and enjoy a soothing experience. When considering how effective and affordable this eye mask is, it is a can’t-miss product for peeling eyelids treatment. In the event you simply want to enjoy a more relaxing experience, then you can even use this eye mask to rest and sleep as well. The Thera Pearl Eye Mask is one of the most trusted eye masks on the market today. 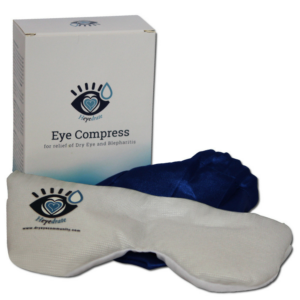 This eye mask allows you to use it as either a cold or hot compress, which helps relieve peeling eyelids and various other symptoms of dry eyes. Give your eyes the rest they need and consider the Thera Pearl Eye Mask as the means of doing so. The Thera Pearl Eye Mask is one of the most affordable eye masks on the market today, and it is still one of the most effective and easy-to-use eye masks on the market. There is no doubt that this is a can’t-miss deal when it comes to peeling eyelids treatment. This eye mask by Thera Pearl is extremely effective, and it is currently trusted by thousands of customers who attest to the positive benefits they receive from using it. It can treat a wide variety of eye problems, including peeling eyelids and dry eyes. The Thera Pearl Eye Mask is extremely easy to use. If you want to use this eye mask as a cold compress, simply place it in the freezer for two to three hours and then wear. If you would rather a warm compress, microwave the eye mask for 10-20 seconds, depending on how warm you prefer it. There may not be a better deal for peeling eyelids treatment than the Thera Pearl Eye Mask, which is the most affordable option on the list and can be used numerous times before needing to be replaced. This eye mask is effective, affordable, and extremely easy to use, checking all of the necessary boxes of a great peeling eyelids treatment. 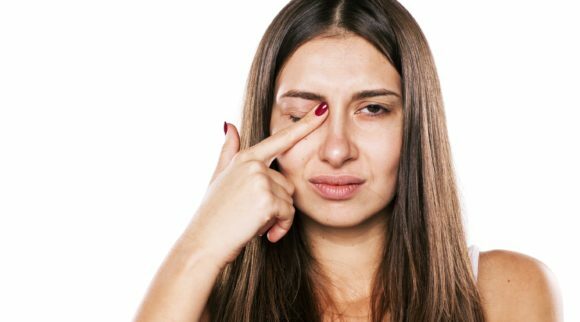 Although peeling eyelids can be incredibly annoying, there are fortunately various options for treatment that are effective at reducing the symptoms as well as helping to prevent future occasions of peeling eyelids. By knowing exactly how to choose the best products, you can find a solution to your peeling eyelids issue. By choosing effective products, such as the ones presented in this review guide, you can ensure relief and minimize the chances of suffering from peeling eyelids in the future. Minor instances of peeling eyelids can easily be treated with at-home care. Be sure to examine your daily routine, and try to find the cause of the peeling eyelids. After determining the cause, it then is easier to choose the best peeling eyelids products for you, although more serious cases may need additional care by a professional. Take control of your peeling eyelids situation by finding out what is causing the dry, peeling eyelids and seeking the proper at-home care to ensure the symptoms are quickly reduced and the underlying cause is treated to prevent future occurrences.